CML originates due to reciprocal translocation in Philadelphia chromosome leading to the formation of fusion product BCR-ABL which constitutively activates tyrosine kinase signaling pathways eventually leading to abnormal proliferation of granulocytic cells. As a therapeutic strategy, BCR-ABL inhibitors have been clinically approved which terminates its phosphorylation activity and retards cancer progression. However, a number of patients develop resistance to inhibitors which demand for the discovery of new inhibitors. Given the drawbacks of present inhibitors, by high throughput virtual screening approaches, present study pursues to identify high affinity compounds targeting BCR-ABL1 anticipated to have safer pharmacological profiles. Five established BCR-ABL inhibitors formed the query compounds for identification of structurally similar compounds by Tanimoto coefficient based linear fingerprint search with a threshold of 95% against PubChemdatabase. Assisted by MolDock algorithm all compounds were docked against BCR-ABL protein in order to retrieve high affinity compounds. The parents and similars were further tested for their ADMET propertiesand bioactivity. Rebastinib formed higher affinity inhibitor than rest of the four established compound investigated in the study. Interestingly, Rebastinib similar compound with Pubchem ID: 67254402 was also shown to have highest affinity than other similars including the similars of respective five parents. In terms of ADMET properties Pubchem ID: 67254402 had appreciable ADMET profile and bioactivity. However, Rebastinib still stood as the best inhibitor in terms of binding affinity and ADMET properties than Pubchem ID: 67254402. Nevertheless, owing to the similar pharmacological properties with Rebastinib, Pubchem ID: 67254402 can be expected to form potential BCR-ABL inhibitor. Keywords: Chronic Myeloid Leukemia, BCR-ABL, BCR-ABL1 inhibitors, Virtual screening methods, Kinase, ADMET, Leukemia. Keywords:Chronic Myeloid Leukemia, BCR-ABL, BCR-ABL1 inhibitors, Virtual screening methods, Kinase, ADMET, Leukemia. Abstract:CML originates due to reciprocal translocation in Philadelphia chromosome leading to the formation of fusion product BCR-ABL which constitutively activates tyrosine kinase signaling pathways eventually leading to abnormal proliferation of granulocytic cells. As a therapeutic strategy, BCR-ABL inhibitors have been clinically approved which terminates its phosphorylation activity and retards cancer progression. However, a number of patients develop resistance to inhibitors which demand for the discovery of new inhibitors. Given the drawbacks of present inhibitors, by high throughput virtual screening approaches, present study pursues to identify high affinity compounds targeting BCR-ABL1 anticipated to have safer pharmacological profiles. Five established BCR-ABL inhibitors formed the query compounds for identification of structurally similar compounds by Tanimoto coefficient based linear fingerprint search with a threshold of 95% against PubChemdatabase. Assisted by MolDock algorithm all compounds were docked against BCR-ABL protein in order to retrieve high affinity compounds. The parents and similars were further tested for their ADMET propertiesand bioactivity. Rebastinib formed higher affinity inhibitor than rest of the four established compound investigated in the study. Interestingly, Rebastinib similar compound with Pubchem ID: 67254402 was also shown to have highest affinity than other similars including the similars of respective five parents. In terms of ADMET properties Pubchem ID: 67254402 had appreciable ADMET profile and bioactivity. However, Rebastinib still stood as the best inhibitor in terms of binding affinity and ADMET properties than Pubchem ID: 67254402. 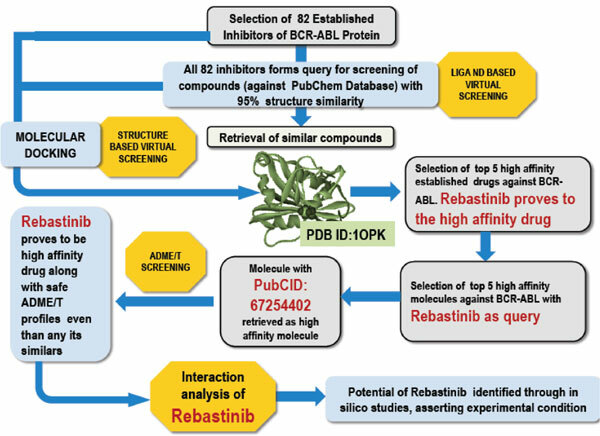 Nevertheless, owing to the similar pharmacological properties with Rebastinib, Pubchem ID: 67254402 can be expected to form potential BCR-ABL inhibitor.